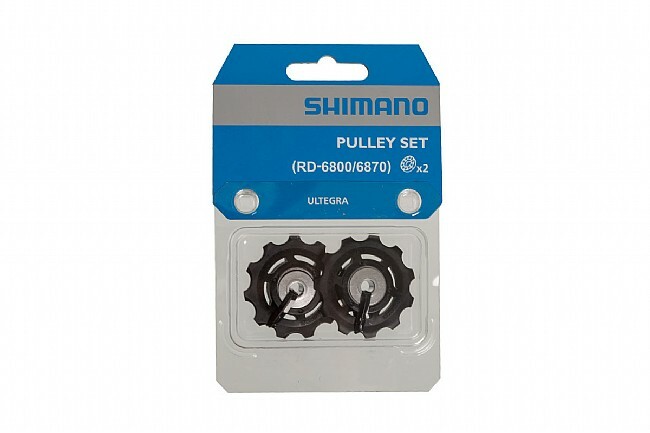 Use this Shimano Ultegra 6800 Derailleur Pulley Set to replace pulleys on 11-speed Ultegra or Ultegra Di2 derailleurs. Both upper and lower pulleys spin smoothly using sealed cartridge bearings. I tried being a cheapskate and buying some cheaper non-OEM pulley's on Amazon. Don't. If you have an Ultegra 6800 rear derailleur, these pulleys are your best and only serious option, unless you want annoying squeaks and probable watt losses. These pulley's may not be something ground breaking, but you just need them because they are the product that works when your old pulley's get beat up too much. Also, these are a wear item, so I would much rather replace these than another component, but make sure if you are riding a lot that you periodically pull these out and give them a cleaning and ensure that they are spinning freely. I ride quite a lot, so I know that they are going to be working hard in my drive train.